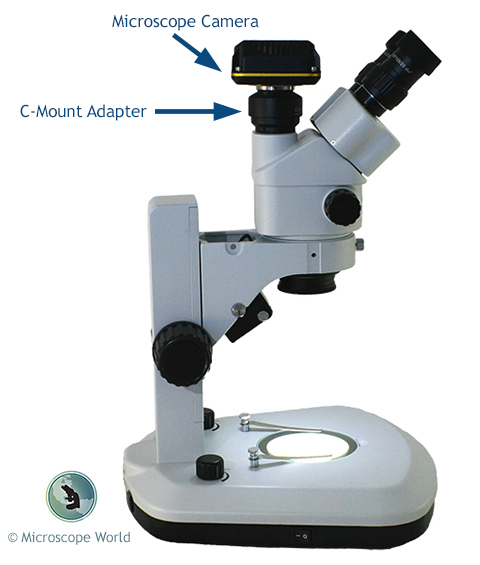 A microscope c-mount adapter allows you to connect a microscope camera to the trinocular port of the microscope. 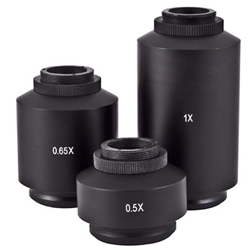 C-Mount adapters are microscope specific, which means they are designed specifically for the brand of microscope to keep the camera in focus while the eyepieces are in focus. For example, if you are using a Zeiss microscope, you need to use the corresponding Zeiss c-mount adapter made for that microscope. In some cases where a c-mount adapter was never developed for a microscope, a generic c-mount adapter can be used to connect a camera, however the camera probably will not be parfocalled (in focus) with the eyepieces simultaneously. C-Mount adapters have a standard 1" (25mm) diameter thread. The microscope c-mount adapter allows you to connect any brand of microscope camera with c-mount threads to the microscope. The c-mount adapter has a reduction lens in it. This allows the camera to see a similar magnified image compared to what the eyepieces see. Depending on the size of the chip in your camera (1/2", 2/3", etc. ), you would want to choose a different magnification c-mount adapter. When using 10x eyepieces and a camera with a 1/2" chip in it, you would want to select either a 0.45x or 0.5x c-mount adapter. The chart above lists the suggested c-mount adapter to use with different camera chips when trying to match up most closely to 10x eyepieces. You can learn more about matching image sensors with c-mount adapters here. If you have questions regarding microscopes or microscope c-mount adapters, Contact Microscope World.